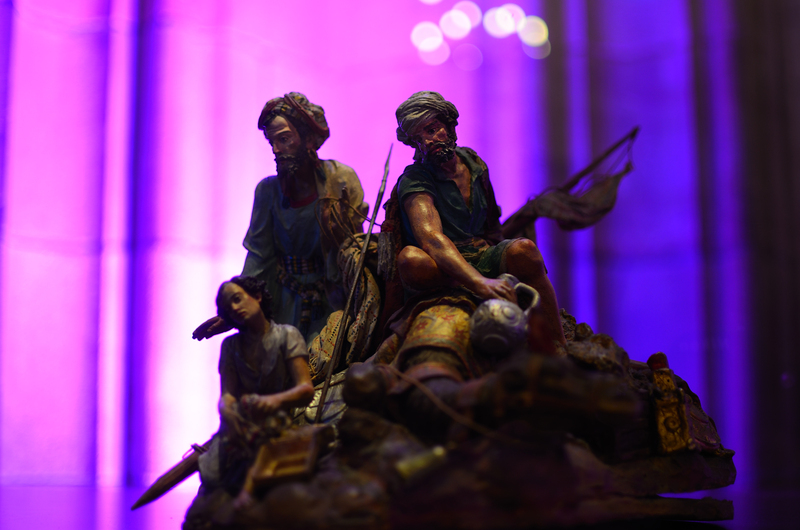 To celebrate the arrival of the Magi I have used an image taken in Barcelona's town hall during an exhibition of sculptor Domenec Talarn i Ribot's works. Talarn, born in Barcelona at carrer Jerusalem (Raval quarter) in 1812, was famous because of his representations of nativity (crèches) at the entrance of his workshop and the beauty of the figures he sculpted. The 12th day of Christmas, the Feast of the Epiphany. My mother celebrated it growing up with bits of straw and a bowl of water for the camels, a humble snack for the 3 kings, all left out before going to bed and vanished at dawn but replaced with small gifts from the magi. Talarn's work that you show here is a beautiful rendering and this photo with the lights and colors behind are perfect. Beautifully executed work of art. Compelling even without knowing the context. Three Kings Day is not celebrated here. Learning about leaving food for the camels sounds so much like our Christmas traditions with Santa and his reindeer. Sweet.